← Have we any Great Public Squares? 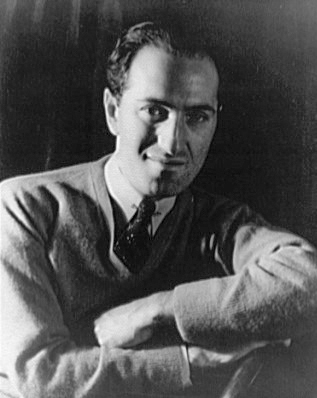 Harmonically, the opening pages of George Gershwin’s “I’ll Build a Stairway to Paradise,” rise through a series of unrelated dominant-tonic gestures, jumping up a half-step each time, yet seemingly going nowhere. It has a strange mix of upward motion and stasis at the same time, like a musical StairMaster, constantly climbing but gaining no elevation. For a song about building a stairway to paradise, it’s deft use of harmony prepares us for the intoxicating refrain, a rapturous pledge to happiness and heaven. With a new step ev’ry day! Stand aside I’m on my way! Shoes! Go on and carry me there! With a new step ev’ry day. Like the circular harmonic motion of the song’s first part, the lyrics of the refrain are filled with paradox. The ebullience of the setting suggests happiness fulfilled, but we’re not in paradise yet. Indeed, the staircase isn’t even finished. And can one really get into paradise if he subscribes to an ethics that allow for getting there “at any price”? If Heaven’s My Destination, can I really tell you to “stand aside, I’m on my way?” In the end, we’re left with so many questions. Why only one step a day? How long will that take? Can anyone else use this staircase? And why, if you’re already en route to eternal bliss, do you have the blues? Of course, it’s all about the going there, not the arrival, the hope, not the reward. The singer accepts the need for both activity and acceptance, the compulsion to build a staircase along with the resignation that it is our shoes (invoked by name, and with a strong rhyme to “blues”) that must “carry us there.” It is one of my favorite Gershwin songs, a display piece for the male “prima donna,” in which the message is a powerful mix of pleasure, hope, work and futility.